This entry was posted in Apple, Technology and tagged 4th gen, apple, arsebollocks, ipod, shuffle, voiceover. Bookmark the permalink. 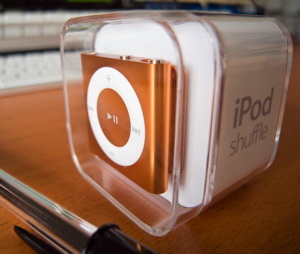 3 Responses to First impressions… iPod Shuffle 4th gen. Ya know, maybe I just need to learn to change the battery in my 2nd generation. At least I could clip that one on without starting the podcast. Yeah, I’ve seriously considered that, Lisa… I replaced the battery on a 1st gen Shuffle once (http://bit.ly/o2NmSA). It looks like a much harder job on the 2nd gen, though (http://bit.ly/mTKFRY) so I’m too squeamish!